Monolithic array of four InGaAs/InP bottom illuminated photodiode chips with large optical apertures separated by a standard 250 μm pitch. The bottom illuminated p-i-n photodiode structures are optimized for low speed monitoring applications in data- and telecom up to 2.5 Gb/s. They offer an excellent responsivity and high speed of response in the wavelength region from 1260 to 1620 nm. 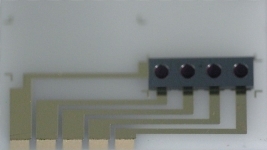 The bottom-illuminated 4 channel photodiode array is flip-chip soldered on a ceramic submount with wrap-around metallization.